Haworthia limnifolia has very tough, woody leaves that come out in a spiral pattern. 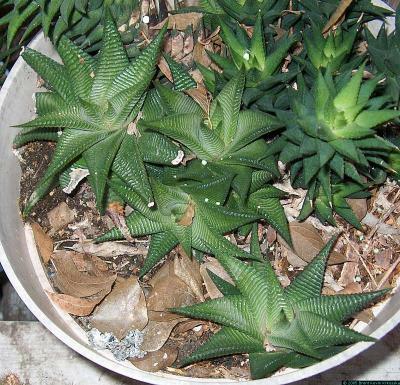 Like most Haworthia, it likes loose and well-drained soil, although it isn't as picky about that as some. It can take water but it isn't going to cry about being neglected. It looks better in full sun, but does fine with an hour or so of early morning sun. It puts out pups via underground stems. If it's planted in a garden bed, the pups can come up 12 to 24 inches away from the parent. It doesn't seem to suffer from root die-back in the winter.